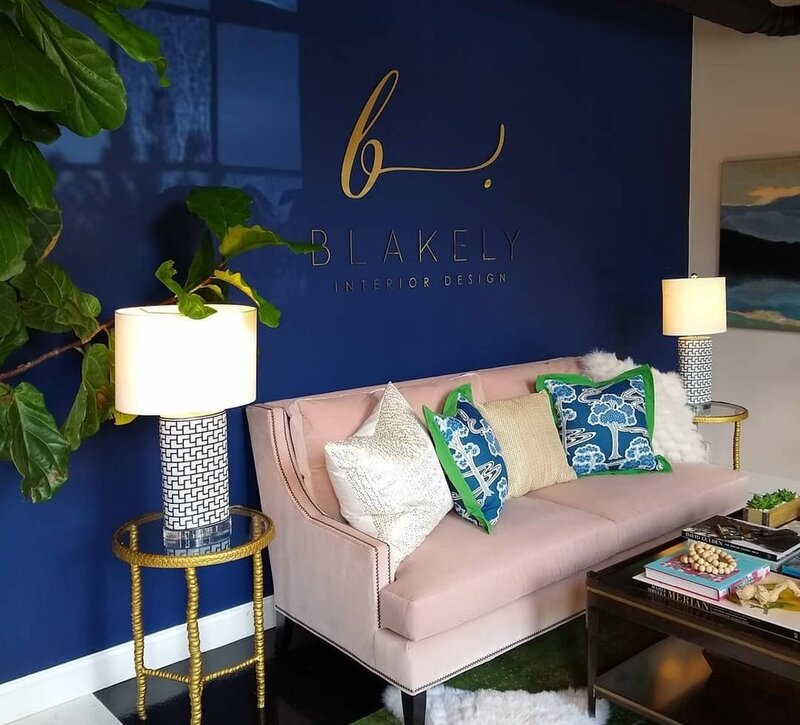 Blakely Interior Design fittingly designed their own studio, which was such a joy to visit! Full of natural light and pops of color… any designer would get inspired. Blakely Interior Design is a full-service high-end residential interior design firm led by Janelle Blakely Photopoulos. Blakely Interior Design services “busy professionals, people who value good design,” Janelle says. The studio is known for a wonderful penchant for color - “our signature aesthetic infuses a lot of color” - and their focus on client experience throughout the entire design process. Founder/Owner/Designer Janelle first got a degree in marketing and business, and she only later became a designer after moving from New Jersey to Rhode Island. According to Janelle, “New Jersey was a very competitive environment, similar to New York. Design never crossed my mind there, I never wanted to be involved there.” Once in Rhode Island, Janelle “very intentionally chose design” - she went to RISD to get her design degree, started her business, and hasn’t looked back since! Visiting McKenzie’s new shop/studio in Warren, RI was such an adventure! The studio is at Parker Mills, a former state-of-the-art center of cotton spinning and textile production. Now, the old mill buildings house warehouses, small businesses, and design studios - including McKenzie Gibson Studio. McKenzie set up her studio less than a year ago, in October 2017. The space (which is all at once McKenzie’s woodshop, metalshop, office and design studio) has everything from McKenzie’s dogs and finished work to scrap metal pieces and material experimentations to powerhammers, coldsaws, and more. She set up every machine herself, and she even made her many of her own work spaces, including her welding table. McKenzie became a furniture designer in a somewhat roundabout way; she pursued Architecture, then went to London to study Art, then finally graduated from RISD’s Furniture Design program in 2017. In 2016, McKenzie was a featured furniture designer on Season 2 of Ellen’s Design Challenge on HGTV, and this year, she debuted work at ICFF in New York City. McKenzie’s work includes amazingly innovative designs with mixed materials (like rope and welded metal) and unique textures and shapes. Her practice and final objects rely on experimental processes, informed by her meticulous data collection. “I love designing and fabricating, but my real love is fiddling with things, experimenting, and figuring out what works,” McKenzie said. “I love the scientific part of the process” - testing and re-testing materials, experimenting with ropes and alloys, collecting data, and perfecting the process. Stay tuned for videos from McKenzie Gibson Studio coming this Thursday to Instagram! Thank you to Blakely Interior Design and McKenzie Gibson Studio for inviting us to your studios! The videos we took at these amazing RI design studios are posted in “Stories” then kept in the “At Work” Archives on our Instagram page (along with videos from the 12 other studios we’ve visited so far!) Check out them out now on Instagram (@designisrhodeisland) and stay tuned for more studio visits in the next few weeks.